Problem. We have an old Soniq E32W13A-AU TV whose remote control was broken. No problem, we just bought a Huayu RM-L1130+8 Universal Remote Control as a replacement, and it was a simple matter of entering code 103 into the remote to get it working with the TV. But there was a problem … the TV was displaying subtitles, and the Huayu remote did not have a button to control subtitles, and using the buttons on the TV there was no way to control subtitles. No problem I thought, I’ll just do a factory reset of the TV and set it up again. That should get rid of the subtitles. But there was a problem. How do you do a factory reset on a Soniq TV? The instruction manual had nothing to say on the matter. Much Googling led me down a few blind alleys until I finally found an article that explained how to do a factory reset. 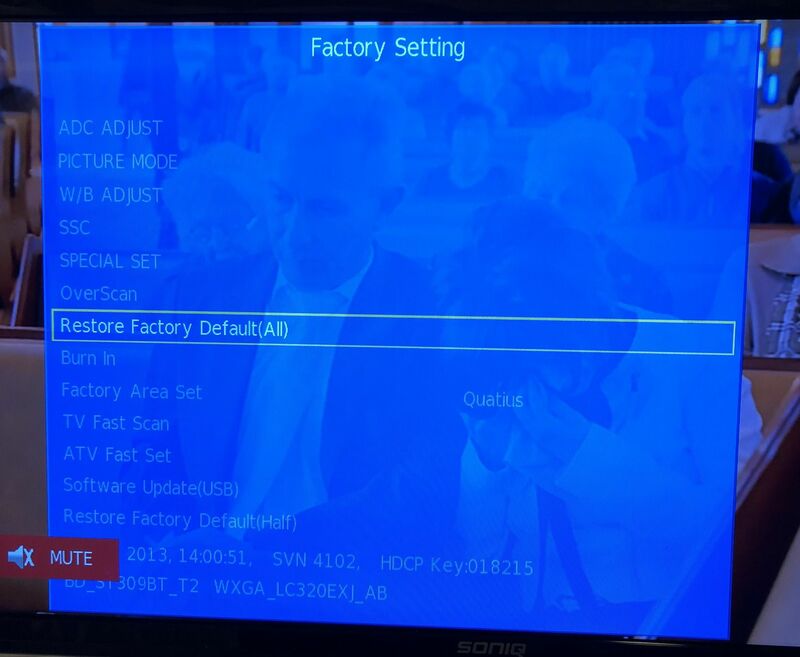 This brought up the Factory Settings menu where I was then able to choose “Restore Factory Default (All)”. After setting up the TV again, subtitles were gone. No problem! This entry was posted in Technology by Lachlan Wetherall. Bookmark the permalink. When i connect power cable ,standby led is on but with push it tv don’t on . Reconnect power cable again ,then push bottom ,tv on !!!?? But remote control don’t work . Big thanks! Was looking for a way to factory reset my soniq tv. You’re a lifesaver. I tried this on Soniq E43V15C-AU and it worked. I used it to fix Chromecast cropping image “overscan by pixel” setting on HDMI port but unfortunately I could not find a way to make this a saved setting. Then choice burn in, and now the screen become flashing blue, white, red, green. continues. TV remote not working and tv bottom not working. I have no help to offer. My web post describes how to to do a restore to factory defaults. What you choose to do with that information, and in particular if you choose some other option from the Factory Settings menu is your responsibility.